Phone games. For us that pride ourselves on lengthy adventures on a console or on PC, games on a phone a lot of the times just don’t captivate us. “Oh, I can tap on this and the bird haphazardly flies into that thing? That’s neat. Sure.” But occasionally a game comes along whose simplicity and addictiveness trumps all. That game currently is Spell Tower. The easiest way to summarize Spell Tower is to throw Tetris and Boggle into a blender, and the smooth, puréed results are Spell Tower. The game screen shows you a mishmash of letters and black blocks that look somewhat reminiscent of a crossword puzzle. In this block of alphabet soup, you are tasked with tapping out words. The words have to be at least three letters long, but you can tap out words in any direction, including the elusive diagonal. Once you find a big, fat, juicy word, you tap once more to take it off the screen. This will have different effects based on which of the four modes you are in. In Tower mode, you simply have 150 letters to find words from, so eliminating letters just makes it so you have less letters to choose from until you cannot make any more words. 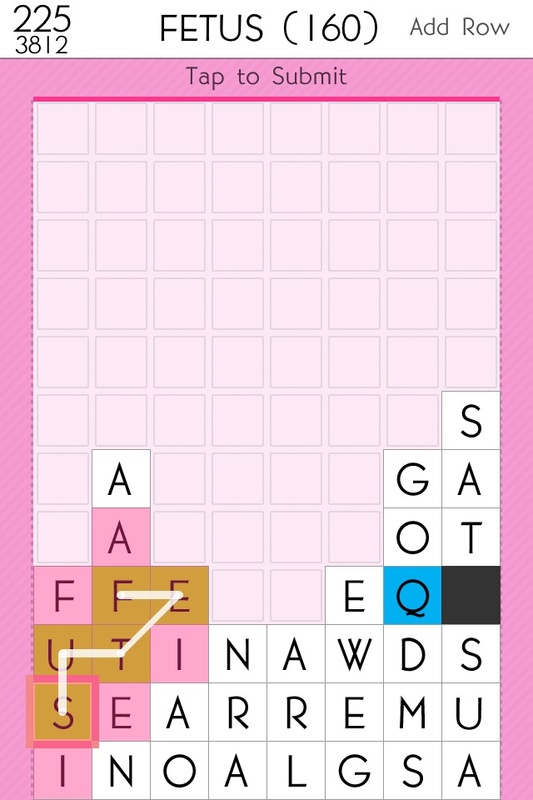 In Puzzle and Extreme Puzzle mode, every time you clear a word, an new row of letters comes up from the bottom. If your tower gets to the top of the screen, you lose. In Rush mode you only have so much time to create words, as every few seconds a new row of letters will come up whether you like it or not. Along with the regular letters, you will come across blue letters that if used in a word will clear an entire row of letters. This is really helpful when you have a row of useless vowels or black blocks in you way, but the downside is that the blue letters are usually tougher to make words from as they are the Z’s, Q’s, X’s, and J’s. Also, as you progress and rack up more and more points, letters will emerge that have numbers with them meaning that the word you create with them have to have that many letters in it. TENSION! The game is, truly, pretty simple, but it is very captivating and its simple visual aesthetic works extremely well, especially when compared to other popular word games (*cough*Words with Friends*cough*). The only downside I have come across in playing is that occasionally the game won’t register correctly where you mash your sweaty, fat finger. This doesn’t feel like an error in the coding, but more that the letters are somewhat tiny. Ninety-five percent of the time this is a non-issue, but occasionally it will crop up. It must also be noted that I have only tried the iPhone version; it is only assumed that the iPad version does not have this an issue at all, unless your fingers are abnormally fat and sweaty. Currently, Spell Tower can be had for $1.99 on the Apple App Store. You should only get it if you like good things. could you please tell me if there is a version for the pc user my mother ;oves playing on my Ipad when I vidit her. As far as I know, there is no PC version of the game, which is too bad.